The best adventures start with coffee. There's nothing easy about dragging yourself out of your warm sleeping bag and tent before the sun comes up, but a steaming cup of camp coffee sure makes the back soreness and lack of plumbing a little more bearable. In the same way, a burnt, flavorless cup of floating coffee grounds can ruin an outdoor excursion before you even leave your campsite. Brewing the perfect cup of coffee comes down to the grind of the coffee bean - do it right, and you'll be ready to take on the day in no time. Do it wrong, and you'll want to crawl back into that sleeping bag and pretend the morning never happened. Follow our coffee grind guide to learn how to grind your coffee for any camp coffee brewing method you choose. You can't grind coffee without a coffee grinder. 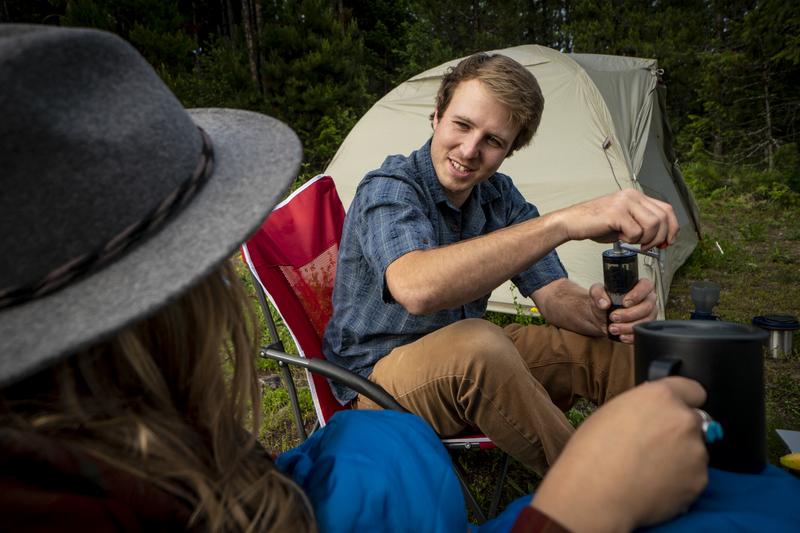 Quality coffee requires fresh grounds - and we bet you don't want to lug your home coffee grinder into the backcountry. Enter the Javamill - a lightweight, handheld coffee grinder that travels wherever you do. A removable fold-down handle means this grinder takes up less room than your water bottle or bug spray canister - and holds up to 6.3 oz of beans at a time. This hand-crank coffee grinder boasts a high-performance ceramic burr and built-in grind adjuster, so you can grind your coffee for an espresso maker or percolator in the same swoop. Use the T-handle above the grind catch to adjust coarseness: turn clockwise for finer grounds, and counterclockwise for coarser grounds. Now you're ready to match your grind to your brew. If you like your morning perk to be brewed the cowboy way in a percolator, you need a very coarse grind to keep those grounds out of your cup. Turn the grind adjuster counter clockwise until you get rough, chunky grounds - then load your percolator and get boiling. If you prefer your coffee pressed in the French way, you need a coarse, chunky grind to prevent your precious grinds from escaping through the press mesh. Dump the grinds in a 30oz press or our personal travel Commuter Javapress and im-press yourself with how delicious your morning brew can be. Neither coarse nor fine, aim for a medium grind when brewing cone-filter-style drip coffee. You'll get the perfect pour over - whether with a filter in our Collapsible Java Drip or without in the Ultralight Java Drip. A fine shot of espresso requires a fine grind. Break down those beans until they're small and smooth before whipping up some espresso shots. Fill your Moka Pot or Mini Espresso maker with fine grinds and enjoy smooth espresso wherever you find yourself waking up. Whatever method of caffeination you choose, a fresh grind makes all the difference. Fine or coarse, percolator or espresso - wake up the right way with the best grind for your brew.